Dr. Carson is a very intelligent man, both in surgery and in critical thinking. Everyone must read this as we welcome Muslims into our mainly Christian country. This has been the underlying premise that has kept Christianity and Islam at war for almost 2000 years. They cannot and will not assimilate into any society that does not embrace their theocratic views. Europe has already suffered a recent invasion of Muslims under the guise of refugees that will destroy Europe as we and they knew it. To ignore the same here will be at our peril. This denial has been the downfall of every non-Muslim nation who has refused to or has been afraid to believe it – do not fall into the trap of thinking anyone who is aware is racist or paranoid – the informed always have the advantage. I want adults and children to understand this regarding MUSLIMS. CAN MUSLIMS BE GOOD AMERICANS? This is very interesting and we all need to read it from start to finish. And send it on to everyone. Maybe this is why our American Muslims are so quiet and not speaking out about any atrocities. Can a good Muslim be a good American? Theologically – no. Because his allegiance is to Allah, The moon god of Arabia . Religiously – no. Because no other religion is accepted by his Allah except Islam. (Quran,2:256)(Kora Scripturally – no. Because his allegiance is to the five Pillars of Islam and the Quran Geographically – no. Because his allegiance is to Mecca, to which he turns in prayer five times a day. Socially – no. Because his allegiance to Islam forbids him to make friends with Christians or Jews. Politically – no. Because he must submit to the mullahs, who teach annihilation of Israel and destruction of America , the great Satan. Domestically – no. Because he is instructed to marry four women and beat and scourge his wife when she disobeys him. (Quran 4:34 Intellectually – no. Because he cannot accept the American Constitution since it is based on Biblical principles and he believes the Bible to be corrupt. Philosophically – no. Because Islam, Muhammad, and the Quran do not allow freedom of religion and expression. Democracy and Islam cannot co-exist. Every Muslim government is either dictatorial or autocratic. Spiritually – no. Because when we declare ‘one nation under God,’ The Christian’s God is loving and kind, while Allah is NEVER referred to as Heavenly father, nor is he ever called love in the Quran’s 99 excellent names. 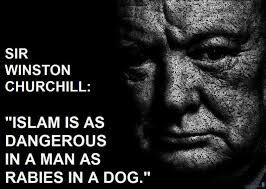 Therefore, after much study and deliberation…Perhaps we should be very suspicious of ALL MUSLIMS in this country. They obviously cannot be both ‘good’ Muslims and ‘good’ Americans. Call it what you wish, it’s still the truth. You had better believe it. The more who understand this, the better it will be for our country and our future. To share this copy and paste into an email. Take Action. We can no longer do nothing. Save money. Save America. Disconnect your cable. MSM is our enemedia and is against everything we believe in.